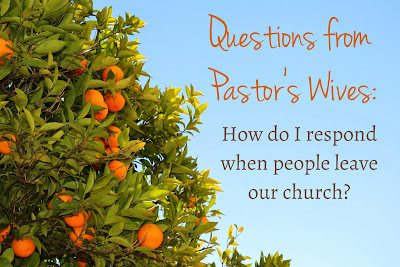 Grace Covers Me: Questions from Pastor's Wives: How Do I Respond When People Leave Our Church? I said last summer that I planned to move away from writing about ministry and church planting, but in reality I haven't moved away from it much at all. Why fight it? I'm passionate about the church, passionate about ministry, and specifically passionate about encouraging pastor's wives. It is perhaps my favorite thing in life when I am invited to speak to pastor's wives, look them in the eye, offer words of encouragement, and pray over them. We'll go with second best today: I've set aside a few questions I received from pastor's wives during the months I was promoting From Good to Grace and am answering one of them today. I'll answer another in the next post. I invite your own insights and experiences in the comment section. "[Since we started our church plant], we've had 3-4 families move on who were very close to us. We consider them friends and of course want them to worship where they feel called. However, it still really hurts, especially for my husband. How do you navigate this journey? It is awkward and sometimes I don't know whether to reach out to the wife or just let it go. It is a lot to go through as a family when you realize people that you labored with will no longer be there. And then the congregation questions us as to where these people have gone or why they have left." 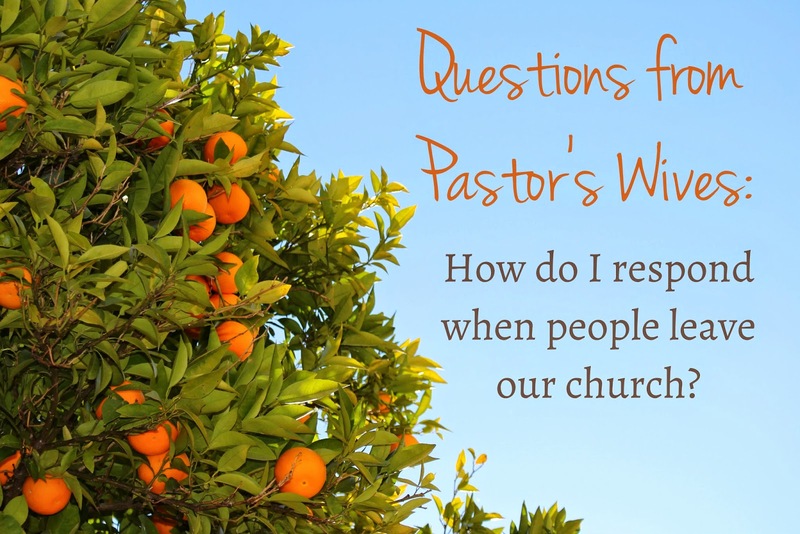 I want to address this question in a way that will be beneficial for everyone in the church, whether you are a pastor's wife or a person leaving or considering leaving your church. First, to the pastor's wife, I empathize with you. The church, especially a church plant, is personal to you, as it should be. This is the unique and specific way that God has called you to lay down your life in honor of Him, and the practical implications of that mean you're laying down your life for people. You not only love the people you're serving and have high hopes for how God will use your church in your community, but you long to experience the unity and community on a personal level as a part of that larger Body. It is painful, then, when those you love and have labored with leave, even if they leave in the best possible way. That's why we must carry with us a foundational understanding that there are few, if any, that will relate to our church as passionately or as personally as we do--the pastor and the pastor's wife. This isn't a value statement on the passion or heart of others, it is simply reflective of what comes with the ministry territory. It is good to care, it's good to have vision and passion, but this truth also gives us a warning: hold people and the church lightly. Neither belong to us; all belong to God. That's what I try to think about when someone leaves, because it assuages the hurt of their leaving. Perhaps God is truly shepherding them toward a different flock. Perhaps our church is truly not a good fit for what He is wanting to do in and through them. And even if I believe it's not a wise decision for them, perhaps God plans to use it for their eventual sanctification. I release them into God's hands, recognizing that they belong to Him and trusting that He is working for their good. In my experience, it's helpful to voice those thoughts to the people leaving, because it keeps the relationship open and unhindered and offers them a blessing as they go. All of this is a process of wading through emotions to get down to that foundational truth, but it helps to have it ever handy: People and the church don't belong to me. Additionally, God and His gospel don't belong just to our church. I pray that the people leaving will find a place of rich gospel teaching and fellowship. But what if people leave for other reasons, such as disagreement over practice, frustration with decisions or direction, or conflict in relationships? What if I feel that they've misunderstood or mischaracterized my husband or our church? What if they leave with slander on their tongue? What if they simply stopped coming and are unwilling to share their reasons for leaving? What if I am feeling anger and hurt but am unable to voice it because of my husband's role? What if people are asking why so-and-so left and I can't tell them the reasons? This means that my husband or our church may be mischaracterized in our community and I am to do nothing. This means that my heart will hurt but I am not to bring others who remain in the church to my "side" to validate my feelings. This means that I am to prayerfully look for the truth or lesson in it all and be willing to acknowledge that I am not perfect and neither is my husband or our church. This means that I must actively work for likely a long period of time to root out bitterness and self-pity in my heart. This means that I trust that the Lord sees all and judges perfectly, that He convicts and deals with all perfectly (including me), and that in due time His will will be done. If I feel that I've been sinned against or my husband has been sinned against, it is important that I not respond in a way that makes me the sinner. I can only do this in light of Christ, who "when He was reviled, He did not revile in return; when He suffered, He did not threaten, but continued entrusting Himself to Him who judges justly" (1 Peter 2:23). I'm not saying this is easy, but I am saying it's necessary and that it's a process of faith, time, and allowing God's sanctification. When someone leaves, it is always an opportunity to return to the question that steadies my soul: "Am I running the race God has set before me?" In other words, am I being faithful with what He's given me to do? That's all I can do. I can't make everyone happy or cause everyone to love everything about my husband or our church, but I can be faithful to run the race ahead of me and invite others to love Christ, who is the true focus of all our work. Second, to people leaving, don't be quick to leave your church. I don't say that as a pastor's wife trying to protect my husband's ministry. I say that as someone who's seen people leave our church well and seen the blessing of continued relationship with people in our church. I also say that as someone who's seen people leave poorly and, in doing so, exacerbate confusion and their own hurts. My advice to you is to be willing to have the hard conversations. If you leave a church because you're frustrated but don't approach your pastors or elders with clear, respectful reasons, you miss an opportunity for possible clarification for you, sanctification for all involved, or the growth of your pastors and elders. A high majority of church leaders are receptive and open to feedback, even criticism, especially if it's spoken with respect and a willingness to listen. What would you add? What have you learned about how to respond when people leave your church?